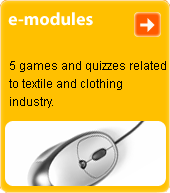 collective term for fabrics with a characteristic indeterminate grainy or moss surface, which are elastic to the touch. These qualities are achieved by means of special crepe weaves, and the rotating of different yarn twists, the high number of these and a special crepe finish. The name is derived from the Latin "crispus" (= curly).